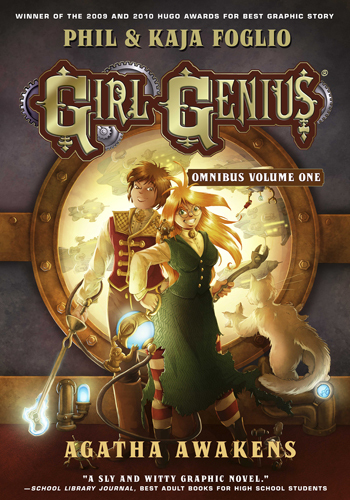 The Girl Genius Omnibus Volume One is a full-color, newly edited edition of the Girl Genius story. This edition contains the storyline first published in issues one through ten of the original comic book magazine, and later in books one through three of our self-published "studio" editions from Airship Entertainment/Studio Foglio, LLC. "Simply said, Girl Genius has everything I look for in a story." Girl Genius, the multiple Hugo Award–winning steampunk webcomic by Phil and KajaFoglio, now collected in hardcover! Swept up to the Baron's Airship City, Agatha finds herself in the midst of the greatest minds of her generation, as well as palace intrigue, dashing heroes, and an imperial cat. Agatha may be the most brilliant mind of her generation and the key to control of the continent, but first, she just has to survive. If you would like to help spread the word about the Girl Genius Omnibus, and want an image to add to a blog post or site, we have a variety of link buttons for you! --scroll to the bottom of the page or click here to see them.